Mileage champion bike of Indian market is back with new astonishing look and advanced technology to give better performance and unbelievable mileage of 90 Kmpl (whooping isn’t it?). The all new Bajaj CT-100 comes with single cylinder 99.27cc 4 stroke engine that produces a maximum power of 8.2 ps and maximum torque of 8.05 Nm at 7500 and 4500 rpm respectively. CT 100 comes only with kick start provision with 4 speed constant mesh transmission system. The CT-100 could attain a maximum speed of upto 90 Kmph. CT 100 employs spring in spring suspension system (SNS) which makes your ride more comfortable on ups and downs of Indian roads. SNS suspension system employs two spring system that acts as a damper and absorbs impact and vibration produced during your ride. New Bajaj CT 100 comes in 3 amazing colors namely black, blue and red which would definitely attract the low cost bike lowers who crave for “value for money”. The bike comes with added seat space, making it more larger than the previous version along with stylish look at a kerb weight of 108Kg making it very easy to handle the heavy traffics and barrow roads. 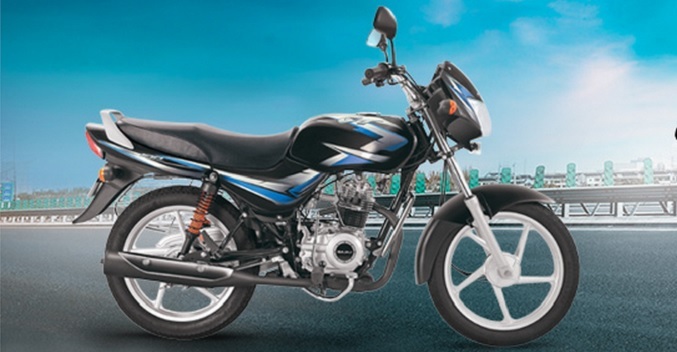 New Bajaj CT 100 comes with two option at reasonable cost, first one with spoke wheel version is priced Rs.36,122 (Ex Showroom-Chennai) and alloy wheel version is priced Rs.39,175 (Ex Showroom-Chennai). Bajaj CT 100 comes with a overall length of 1956 mm (spoke wheel), height 1072 mm with a wheel base of 1235 mm that gives stability while driving even in rough conditions. The bike has a fuel tank capacity of 10.5 Litres.